Intravenous (IV) nutrient therapy is a potent combination of vitamins, minerals and other nutrients delivered directly into the bloodstream, which provides an immediate and lasting boost in energy and well-being, and supports the immune system in times of stress and illness. The ‘Myers Cocktail’ was named after it’s inventor Dr. John Myers, and made popular by Dr. Alan Gaby MD. It contains a high dose of B-vitamins, Vitamin C, and the minerals Magnesium and Calcium. Popular amongst athletes, this formula is great for giving an energy boost, improving endurance, as well as strengthening the immune system. ​Would I Benefit From IV Therapy? Do you often feel tired and sluggish? Would you like a boost of energy? Do you seem to catch every cold? Are you an athlete looking to improve endurance and enhance performance? 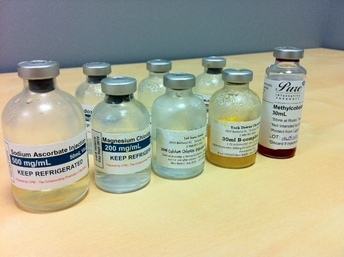 IV Nutrient Therapy may be the answer. Nutrients can also be depleted through poor diet, defective digestion/absorption, over exertion, chronic stress, and over-consumption of alcohol. 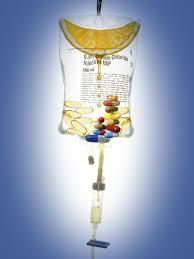 IV Nutrient Therapy delivers nutrients directly into the bloodstream, completely bypassing the digestive system. Because of this it is possible to increase the blood concentration of several essential vitamins and minerals beyond that which can be achieved with oral supplementation. IV Nutrient Therapy is generally regarded as a safe treatment. Mild side effects may include a feeling of warmth or flushing due to increased circulation. Some people may experience lowered blood pressure and light-headedness. Side effects can generally be avoided by slowing the rate of infusion. Other side effects may include redness or mild discomfort at the site of injection, which typically gets better shortly after treatment. IV therapy may not be suitable for those with kidney disease. How do I book in for an IV Treatment? You can book an appointment by calling the clinic at 604-876-1150.